Enjoy Oahu private & personal on this exclusive adventure around the island. Hop into one of our modified safari Jeeps for an adventure you'll remember for a lifetime. Don't be fooled by copycats. We are the original Jeep tour company in Hawaii. All of our guides are born and raised in Hawaii and will customize your tour based on what you want to do, not a cookie-cutter planed out day. This is a go at your own pace experience designed to get the most out of your day on Oahu. Big buses and crowds are not the way you want to experience Hawaii. 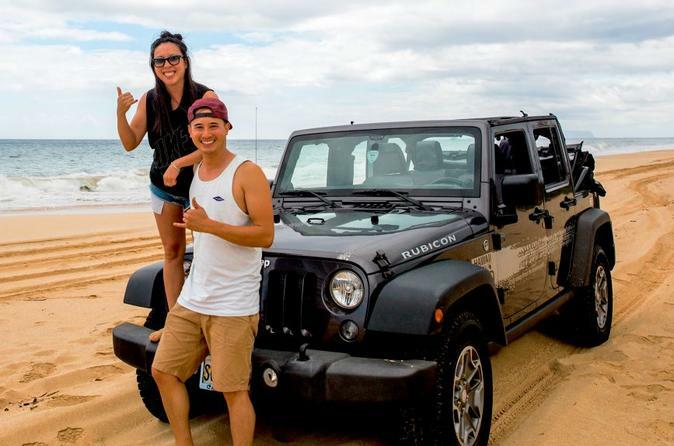 With Hawaii Jeep Tours, it’s all about our private and personalized service. As a traveler, you want to be less of a tourist and have more of an adventure, that’s why we’re staffed with only the most knowledgeable local guides, born and raised in the islands to provide you a truly memorable day here in Hawaii. Each Private Jeep tour is customized for you personally. If you want more beach time, no problem. A waterfall? Done. Want to sample some local food, get photo opportunities or anything else......we aim high.....let's do it! Discover the islands in a totally different way with our private safari jeep tour. This is a "go at your own pace" private tour is the best way to see the island. Our customized, open air Jeeps allow you to drop the top, soak up the sun and really enjoy Hawaii. Get to know Oahu like the palm of your hand. Each side of the island is unique and exciting, you don't want to miss out on any of it. Venture around Oahu with your own personal local guide. Oahu's diverse landscapes are some of the most breathtaking in the island chain. We'll take you to the lesser known, off the beaten path sights that large tour companies just don't include in their itineraries. As a local company with strong values and local knowledge, we are committed to giving each of our guests the experience of a lifetime.